Tokyo just can't catch a break. 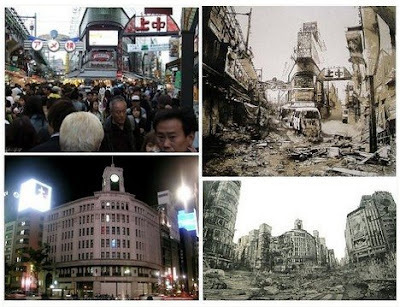 First there was Godzilla, now there is artist Hisaharu Motoda who depicts Tokyo in some breathtaking ruins. If you can wrap your head around that image, then you’ve got an idea of what Japanese artist Hisaharu Motoda conveys in his series of Neo-Ruins lithographs: exceptionally detailed, vivid representations of a futuristic, post-apocalyptic Tokyo, where humans are nowhere to be found and nature fights back in a bid to take over our concrete jungles.